The best playgrounds throughout the country. 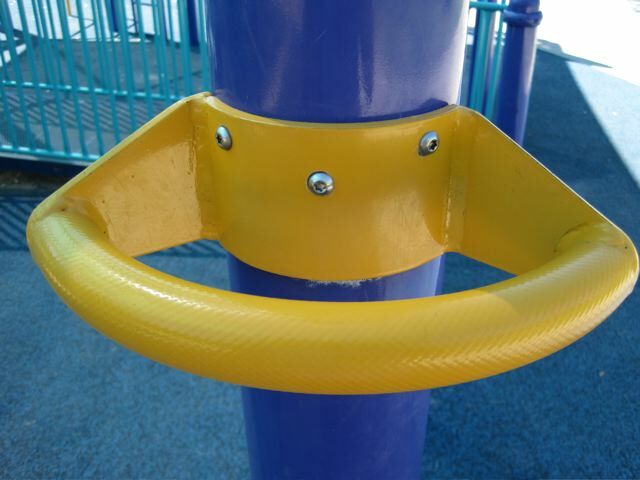 Because playgrounds deserve the attention. I obviously focus on formal play structures at this site, not for any philosophical reasons, really, other than that's what I'm interested in and that's primarily what the playgrounds in my neck of the woods (or deserts) have to offer. It's not much a surprise to me that Vashon Island, Washington, whose Ober Park playground's secret weapon is an open grassy area surrounded by trees, is also home to a "nature preschool," the Cedarsong Nature School. The mission of the school is "to provide opportunities for direct experience with nature." In other words, it's to play outside. Says the description for the preschool program, "Your child is invited to join us in running through the forest, discovering and decorating hide-outs, making dreamcatchers and musical instruments, creating magic wands and magic potions, learning about the plants, creating a unique nature journal, playing make believe, making up forest songs and dances, and telling stories around a campfire." While they might be able to handle make-believe, somehow I don't think the Kompan or Rainbow systems would handle a campfire very well. For those of us unable to afford (or not wanting to spend the time driving to) a summer trip to San Diego, Flagstaff is the next best thing for Valley residents. At an elevation of well over a mile, it's usually a good 25 to 30 degrees cooler than the Phoenix area, and it's only a 2-hour drive from central Phoenix. At the intersection of Interstates 40 and 17, and as the gateway to the Grand Canyon (not to mention the old Route 66 running right through it), it also gets a fair amount of out-of-state travelers' traffic. The best playground in town is Thorpe Park. 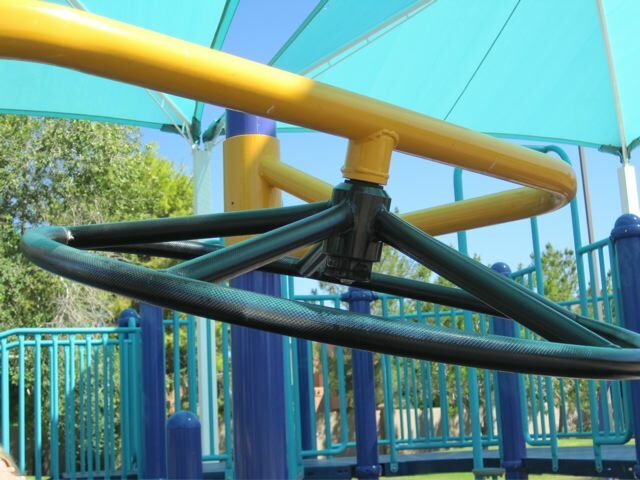 It's just west of downtown (which is about a 5-minute drive north of I-40) and has a wide variety of play structures for a wide variety of ages. There's a sizeable older-kids bulbous play structure, with a smaller, slightly-less bulbous play structure for the younger kids a couple hundred feet away (both in sand or wood chips, I forget which). 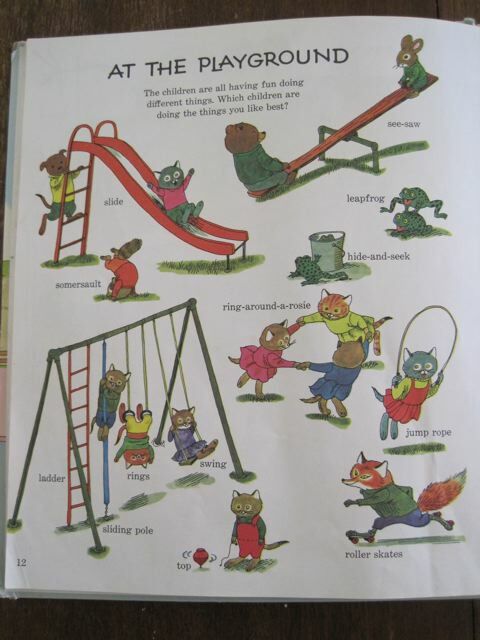 There are also separate bouncy/springy metal animal sit-upons, as well as a much older metal jungle gym in the shape of a fire truck. So it's got a fair amount of play structures, not to mention a decent amount of grassy area. If there's any distinguishing feature of the park, it's a bank of about 10 swings that sits on the western edge of the play area. The play area gently slopes down to the eastern edge where the play structures are, so that when you're swinging high, it gives you a bit of a feeling of swinging over downtown Flagstaff. It's a great swing area. It's been a couple years since we've gone to the playground, so I don't have any decent pictures, but you can view some pictures here. In addition to the play structures and swings, it's surrounded by pines on the western side and there are some places to hike nearby if your family is looking for some more back-to-nature play. This is a nice little park, and if your kids need some playground time, either because Phoenix is too darn hot or because they've been in the car for 6 hours, Thorpe Park will be a nice diversion. Parking: Parking lot and street parking. Not sure about public transportation. Amenities: Restrooms, some shade from the pine trees, but not as shady as you might like from intense high-altitude sun. Downtown Flagstaff is maybe a half-mile to a mile away. 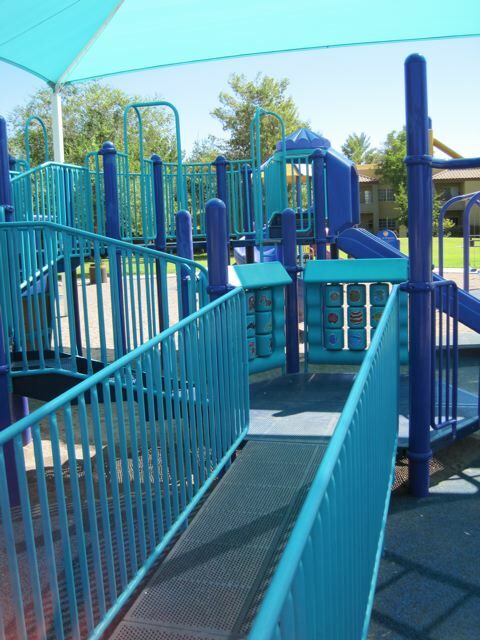 Bottom Line: Best playground in Flagstaff. There's more than enough coverage on Imagination Playground, designed David Rockwell's re-imagining of adventure playgrounds for the 21st century. But I figured I'd add to the chorus. In creating the Imagination Playground in Lower Manhattan — a playground with lots of loose parts for children to create their own play spaces — we realized that many of the elements with the greatest value to children were inexpensive and portable. OK, that's a misleading headline. Somebody might read that and think I'm really proposing the demolition of Irvine, CA's Adventure Playground. The playground looks more like a vacant lot than a fancy new playground with brightly colored equipment, but that's the point, really. With mud, fort-like structures, movable parts, rope bridges, and the like, it sounds very much like a playground for creativity, an Imagination Playground on the cheap (not to mention more than 60 years ahead of its time, since the concept's been floating around since the 1940s). But I do wish that they had one of these near us. There are just 3 (and since AP's been closed for a couple summers, just 2) of these in the US, as opposed to a thousand or so in Europe. Wouldn't it be cool to see your kids tromp through the mud, construct a fort (repeatedly), and cross a rope bridge? Maybe even -- we can dream, right? -- pretend to operate a bulldozer? The park itself has some room for running, a meandering path, and a fair number of reasonably mature trees. It also has a playground, one that Miss Mary Mack remembered for something called "the wheel." No, "the wheel" was not some sort of medieval torture device. It was just that wheel thingy above, maybe 2 1/2 feet in diameter and about 6 feet off the ground. If a kid leans off the adjacent platform, they can grab a hold and make almost one full rotation. Miss Mary Mack had lots of fun on it... for maybe a couple minutes, then moved on. Luckily, there were a couple other kids there on what proved to be a record-setting day heat-wise in Phoenix (111 degrees, woo!) so that Miss Mary Mack could play with (and show off to) other kids. I suspect the park has more kids on days when the heat isn't quite so bad. Also luckily, the main (big-kid) playground structure had a shade structure which somewhat helped. (As a parent, I eventually excused myself to the shade of one of the trees lining the perimeter of the play area.) There's nothing particular noteworthy about the play area itself -- it has the typical big-kid/small-kid play structure dichotomy with 2 toddler and 2 preschool swings. There's sand, but part of the big-kid structure is wheelchair-accessible via that slightly springy surface stuff. 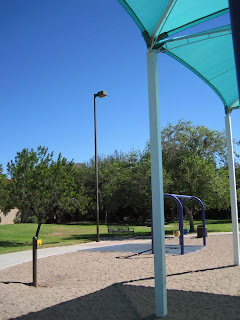 I wouldn't describe the park as having a surplus of shade and shaded-seating, but compared to a lot of other Phoenix-area parks, it does just fine. There's no reason to visit this park if you're more than 15 minutes away because you almost certainly have a playground that provides a similar experience closer to you. Still, it might be enough to make your kids smile. Parking: Street parking (but not a problem). Bus serves 44th St. and probably (occasionally) Campbell Ave. itself. Amenities: No restrooms, some shade from the trees, ramadas. Ground zero for the LGO folks (La Grande Orange, Postino) is a quarter-mile away. That's pretty close for a Phoenix parks amenity. I've enjoyed dipping into Richard Scarry books as a parent. 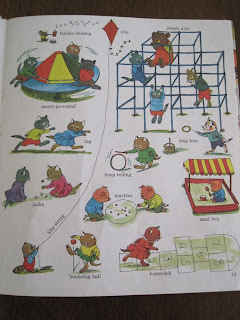 More so than possibly any author, I think Scarry's work was more diffused into American kids' memories of a certain time and age. 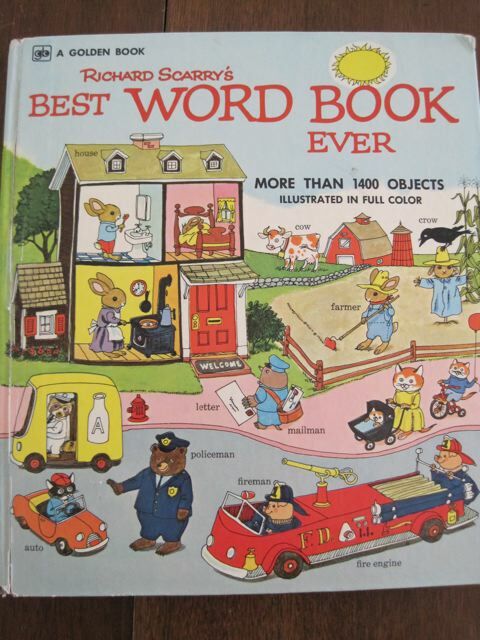 This book is my wife's from when she was a child, but I had a copy as well. What's interesting to me as I scan what Scarry chose to include in his "At the Playground" set of pages above is that fixed playground equipment isn't the primary focus. Sure we see classics like seesaws, slides, swings, merry-go-rounds, jungle gyms, and sandboxes, but just 15 of the 36 animals on the page are using those features. I would hazard a guess to say that the ratio for the best playgrounds is somewhat similar. If the kids are just using the fixed features, I tend to think that the kids will move on to playgrounds when they (and their caregivers) find something new. I know that with Labor Day coming up and schools back in session, many areas of the country may see a decrease their use of playgrounds, but in the desert climates of Arizona, Labor Day means that the first month of school is in the books and it's possible to use playgrounds after 9:30 in the morning. So playground usage actually goes up 'round here. In honor of this fact, and celebrating playgrounds generally, here's a list of playground and play-inspired songs. Or songs from play-inspired albums. Or songs from albums with "playground" in the name (excluding Putumayo Kids). All I ask, when I hear about a day for something, is that people agree on what that day is and what it should be called. KaBOOM! calls it 2010 Play Day, but is sort of vague on when it is (it would appear to be this weekend through next weekend, Sept, 25th). It's basically a day (held in conjunction with National Public Lands Day) designed to encourage people to play outside and maybe help spruce up a playground or park. I get the purpose of the days, although the idea that Nick would be promoting turning off the TV set and computer makes about as much sense to me as REI telling people to stay at home and watch Two and a Half Men. And I'm not going to make the argument that "every day should be a day of play," because that's not the point here -- they want a single day to raise visibility. The problem is that it's probably still not visible enough. National Public Lands Day is a (relatively) big deal 'round these parts, but there doesn't appear to be a single Play Day event in the Phoenix area. Maybe it's more visible elsewhere, and if it is, good on them. But there's room for improvement, no doubt. You know, I don't really remember much about the climbing structures at the southern end of West Seattle's Lincoln Park. There were a couple, I think, one for the big kids, one for the small. They weren't new or old, flashy or rundown. They were just... there. Really, they're fine, and I'm sure for the single-digit-aged residents of West Seattle, it's a playground that gets lots of use. And the park itself is lovely, with a seawall providing the bikers and joggers and walkers lovely westward views of Puget Sound and lots of tall trees -- it seems to be the closest Seattle gets to Vancouver's Stanley Park. What I want to talk about is the zip line. I'm used to zip lines that are basically metal handles in a grooved metal track that's about 6-10 feet long (and maybe 6 feet off the ground). Kids hang on, and if you're old enough you generate enough momentum when you jump to make it to the other end of the zip line. Kids seem to like them enough, but as a parent it requires a lot of attention for the little ones who need to be pushed (that could be done by other kids) or want to do it even though they don't have the hanging arm strength. 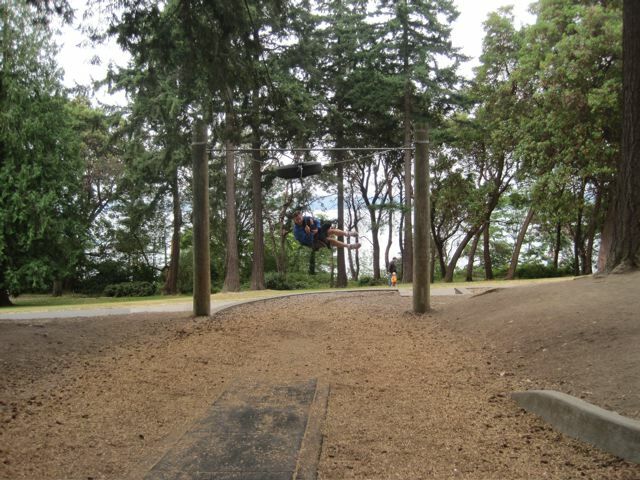 It's possible that there are other zip lines like Lincoln Park's (right next to the playground), but I've never seen 'em. The line itself is maybe 25 feet off the ground, and runs maybe 50 feet in length. Suspended from the line is a rope swing whose seat is maybe 3 feet off the ground as you're zipping down the line. You get on the platform (top picture) and the downward slope of the line gets you going in a fast (but not unreasonably so) manner down to the other end, where a big tire at the zip line puts a stop to your movement, flipping you at a 45-to-90-degree angle to the ground and sending you back up the line a little. We spent a good hour there at the zip line with Miss Mary Mack, Little Boy Blue, and a couple of our local friends' kids. Miss Mary Mack loved it -- she and our friends' kids spent time rating each others' runs down the line. I went on a few runs with Little Boy Blue, but he was also able to do it himself. It requires kids to cooperate (because it's hard to get on the swing at the top without somebody steadying it), it has some danger (but not too much), and gives kids a sensation they don't normally get, that of flying. 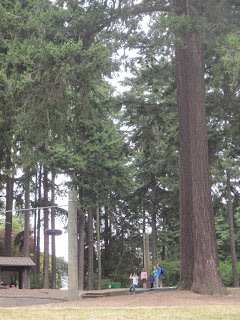 I'm not sure the zip line is so awesome that I'd recommend making it a part of a Seattle visit. But I'm not so sure that I wouldn't recommend it, either. Parking: A couple lots, one bigger, one smaller. Look like they often get packed. Also served by bus. Amenities: Rustic bathrooms down the hill, a bunch of shade from the trees, ramadas. The playground and zip line are dug in a bit, surrounded by ledges, so decent places to sit. No services nearby (unless you count the ferry). Bottom Line: Zip line! Zip line! Zip line! If you're enmeshed in the world of playground design, you certainly were aware of Rebecca Mead's article in the New Yorker a couple months ago. She spent a lot of time talking about the recently-opened Imagination Playground at Burling Slip in South Street Seaport in New York City. The basic conceit of Imagination Playground is not fixed equipment but rather movable pieces -- to me they sound like foam blocks on steroids. She also spends a lot of time talking about how kids use playgrounds in ways their designers never intended. If you're not enmeshed in the world of playground design and aren't a New Yorker subscriber, it's not so interesting that I'd recommend that you track down the article (though it's certainly a pleasant read). In lieu of reading the article, I'd recommend listening to the podcast of maybe 15 minutes or so, which you can do so here. I write the nationally-known kids and family music website Zooglobble. I also play the ukulele, which is ten tons of fun. Sometimes I go to playgrounds. All text and images copyright 2010 and onward by Stefan Shepherd. Watermark theme. Powered by Blogger.